Easy to put together! Can't wait to use it (Christmas present). I've had several strollers, I bought the Vista for my (1 yr old) third baby. I love it! My only complaint is that I wish the sun shade could come down more. My poor baby gets blasted in the face by the sun a lot in it. Otherwise, it pushes really easily, it was easy to put together and fold up, all the seat positions are good. My baby sleeps really well in it. I also bought the board attachment and my 6 yr old rides on it. She's about 5 lbs away from the weight limit. I'll get enough use out of it for now to justify the price of the attachment (around $90). I bought a cup holder attachment and it will not stay on very well. Overall- I love it!!! I am so happy I decided to get this one. While I haven't used the UppaBaby Vista as yet, baby is still two weeks away, I knew what I was getting into when I purchased it. This is a top product. It is solidly built, functionally designed, and looks great too. My first stroller system for my first child was an Emaljunga, which was a luxury car of stroller systems, big and heavy, so I wanted to get something for number two that was sturdy and also featured comfort enhancing details but maybe not so big and heavy since I know live in New York City. The Vista has a similar front and rear wheels shock absorption system and I am very excited about the car seat adapter capability, mosquito net, and UV protection bonnets. 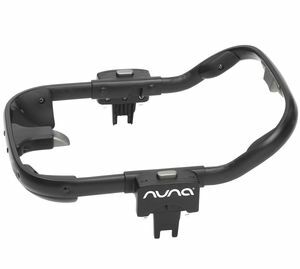 Moreover, the Vista has swivel front wheels which increases maneuverability and can also be locked to increase control when going up and down hills. 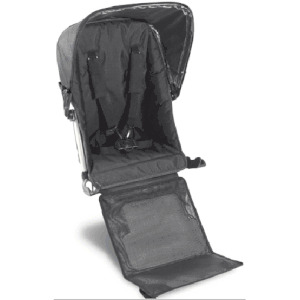 The bassinet and stroller seat can be turned to face either direction. Also, the stroller can be folded with the seat still attached.Albee Baby took care of me, the shipping was fast and free and the customer service was great two. There was a problem with my shipping information, I forgot to give a contact number, once I submitted it they called within minutes to confirm that my shipment was back on schedule. ProsSturdy Highly functional Easy to handle Folds Easy to clean. Optional accessories. Best UsesDesigned to go anywhere. The bassinet makes it perfect for newborns. The stroller seat can handle the most rambunctious toddlers. I got this stroller for my second baby. My older child is 3 years old and not into strollers anymore. This stroller is great. It solves all of the problems I had with previous strollers in the past. Great bug net, sun canopy, and a really smooth ride. I would highly recommend this product. Also this model has all the same features as the 2013 version but much cheaper. Love this system -- best purchase ever*! First off, I'm the nana, but my busy daughter left the stroller research to me. And we bought her two strollers, the BOB for running and the Vista for around town and travel. No other system comes with as many useful accessories as this stroller. We travel aLOT and I always interview the Vista owners I see in Miami, NYC, Seattle, San Diego, SFO . . . All of them rave about the Uppababy. She used the maxi-cosi infant seat until recently, and it popped on and off so easily for most trips involving car transfers, but the bassinet was also useful with a newborn, either next to the bed or wherever she happens to be around the house. The mosquito netting, sunshields and rainshields all work very well and she added the snack bar later. Pros1) Versatile, cost-effective and includes everything but the bag for air travel. 2) Everything works, once you learn how to open and close the stroller, and this thing is a workhorse. Holds a ridiculous amount of stuff, too. 3) All the bells and whistles of status strollers that cost twice as much. 4) Made in the USA!!! Cons* Still worth five stars, but here are the issues: 1) An amazing stroller, not a great travel stroller if you are traveling by plane or public transportation. Still worth taking if you're going to do lots of strolling, but it isn't light and it takes two hands to fold it. You can gate check it in the travel bag and any damage is covered IF you registered. This is the only problem we've ever had with this stroller, but the foot rest snapped off twice due to rough handling by the gate agents. I think we'll bet the G-Luxe for future trips. 2) Some day they will lower the snack bar so children can see what is in there, and integrate the side cup-holder so there isn't the dorky little unit hanging off the side. Those are both VERY minor items but worth mentioning. 3) 1) A WORD of advice -- do NOT forget to register the warranty. They stand behind this product, but it MUST be registered. It doesn't matter if you have the receipt or not. It doesn't matter if you know the serial number. I paid to have the replacement part fed-ex'ed both times, which says a lot about their customer service, but it was on my dime. This color (Carlin green) was discontinued/replaced by a slightly darker green (Ella) for 2013. This meant the price for this color was discounted $100, plus free shipping and no tax from Albee. I ordered standard delivery and had the stroller on my doorstep in less than 48 hours - the week before Christmas, no less! It was a breeze to put together (by myself & 8.5 months prego) and required no tools at all. It's solid, well-made, high quality and drop-dead gorgeous! I can't comment to the longevity of the stroller and day-to-day experiences of owning it, but in terms of a *perfect* ordering process & buying experience, I could not be happier with Albee Baby. Absolutely 5 stars all the way! Love this stroller! Best quality/price deal! Pros1. Light weight 2. Very easy to manipulate 3. Excellent quality 4. Thorough design. Great stroller, and the bassinet has been used a lot more then I thought it would be. I absolutely love this stroller. I was researching a lot prior to buying, plus I tried it out in real-life situations (I worked as babysitter) and saw how it looked like and rolled after 3 years of use and after finding a great deal on this site, I bought it and have no regrets.Gave 4* because of minor flaws. 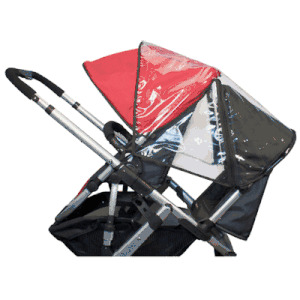 ConsRear wheels are very wide (sometimes get stuck in tiny spaces) Expandable canopy has mesh on the sides and in order to hide the baby from the sun shinning on its face through the mesh, you need to throw blanket on it. Wheels a little squeaky. Love the materials and quality of the product. They've thought of everything. Gonna even use the bassinet as baby's bed for the first little while. Just so versatile. Amazing. Changed my life. Easily bumps down the stairs of our apartment building. Smooth ride! Baby LOVES it! ProsSmooth. Easy to "drive." Love the different angles of the seat and that baby can face in or out. Love the bassinet for travel and for early days when he wanted to sleep on the go. ConsA bit hard to collapse and heavy to lift when collapsed. Takes up half of the trunk of our car. I would recommend this stroller to anyone, I did so much research before I bought this stroller and couldn't be happier with my decision. Smooth ride, sturdy frame, comes with so many accessories, easily expands to hold more kids as your family grows - this stroller has it all. I can honestly say there are only two negatives for this stroller; the first is that its not the lightest out there, but the added weight is worth it for stability and longevity of use. 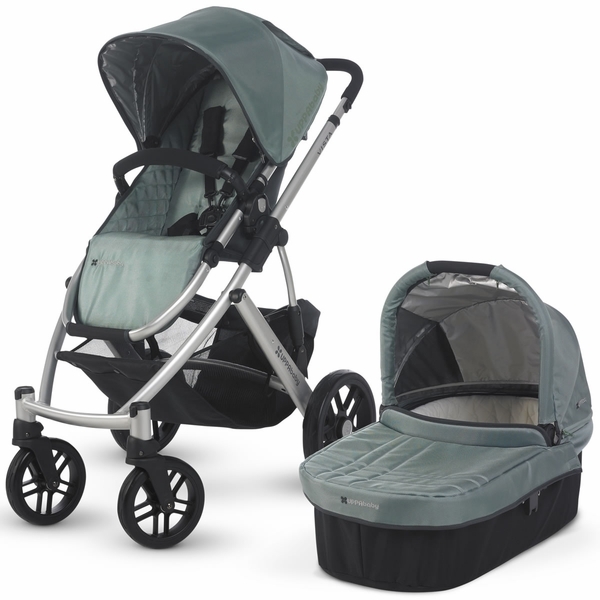 Second is that its slightly wider than the average stroller, but again that only adds to the stability of the stroller. You won't regret it! 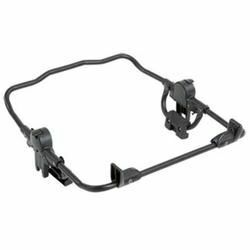 Uppababy vista stroler very easy to use, light weight! Easy to handle, you can drive with only one finger. I love the color also very unique. We love our Vista. It's easy to handle, easy to fold, easy to move/change/remove the seat. The storage below the seat is a great size. And, it folds up very easily. My only issue so far (my son is only 3 weeks old) is that he will definitely not fit in the bassinet until 6 months. He's already close to the max height capacity. I also recommend the travel case and insurance package. We sold another upper line stroller to buy this one and we love it! My daughter loves how upright the seat sits and we got the snack tray which keeps her happy on any length walk. The canopy is huge so the sun is never in her eyes. The basket is amazing, and the color is so pretty and unique in my neighbourhood. 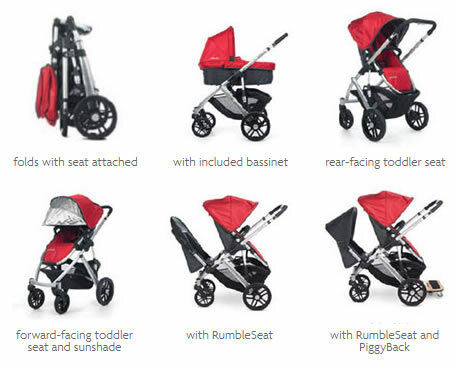 I had been researching stroller systems for months while pregnant with our 2nd, and had gone through many different baby review books, consumer reports, etc. ; I finally decided on the Uppa Baby Vista system and am so happy with this decision! This is not a cheap stroller system but is definitely worth it. I had looked through many different sites, including craigslist and ebay to look at used systems. The price here at albeebaby is by far the best; you have a lower price for this color, and this price was the same as those for the used systems elsewhere. The yellow is actually very nice, kind of a maize color and not an obnoxious yellow at all. I love it!! It's bright and cheery vs. obnoxious and loud. The lower price here as well as the free shipping and no sales tax meant that even with the store discount coupons you can get elsewhere these prices were still much better than anything else (even for the car seat we got to go with this). The stroller system itself is wonderful. Since my daughter is only 1.5 months old, we have not used the seat for this yet, only the car seat adapter and the pram/bassinet. I did, however, fully test out the stroller seat at a nearby store that carried this stroller (i highly recommend doing this for any stroller system you are considering). When I got this in the mail, I opened up everything and tried out all of the parts, including the rain and bug/sun shields. These are a really nice inclusion for this system and add to the ultimate savings since you won't have to purchase them separately. They attach quite easily. For the car seat adapter, I had researched and decided on a Chicco car seat and thus bought the adapter for this system. 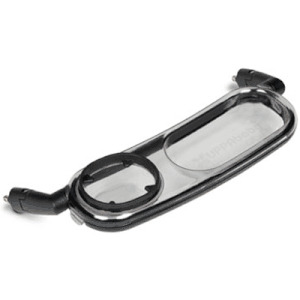 this adapter is really very easy to attach and detach and the car seat fits securely and easily into it. I will note that I bought the Miro pattern Chicco car seat (yellow/black/white circle pattern) and it all goes so well together with this system. 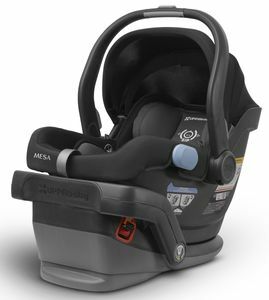 It also has the car seat up higher and closer to you; others have come up to me to compliment me on the stroller seem to always mention this as well. I initially didn't think I would get any real use out of the pram/bassinet that comes with this system, since you really cannot use it past a certain age/weight. I'm surprised by how much I've actually used it already. It would be very useful for those living in a big city who walk to a lot of different places. I don't think it would be great to use this folded up if I was on public transport, but many trains can accommodate a stroller where you wouldn't have to fold this up. We currently live in the suburbs and I still have gotten a lot of use out of it. 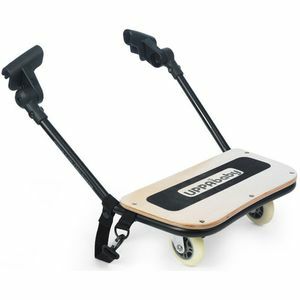 I use it for walks around my neighborhood, and the larger wheels on this system (which was something for which I had looked) make walking on uneven sidewalks much easier. I've also used the pram/bassinet when going to the zoo with my older daughter; it is nice to not have to have the baby in a car seat which can get cramped and hot when walking around for an extended period of time. The sun/bug shield was really nice to have and easy to pull up to replace a pacifier as needed. 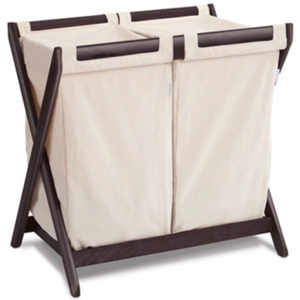 there are also pockets on the end of the bassinet itself to put your cell phone and keys. It is also nice to have the bassinet/pram when a diaper change is needed... you can avoid having to navigate getting in and out of busy public restrooms, you just put down your changing mat in the bottom of the bassinet and can do a quick change right there. Although not currently using the stroller seat, when I was testing out various systems I really wanted one that had nice recline positions. I didn't like the strap pull type of reclines that came with the jogger-style strollers. I also liked the fact that you could have the seat forward or rear facing. The collapse function on this stroller takes a few times to really get the hang of, but after a couple times doing it then it really isn't that hard and really quite easy and not an issue. The only thing is that it really does take two hands to collapse the stroller, because you have to push the button on the side while pushing in the handle. some stroller review sites will have a video that shows this collapse function (you can prob easily find it via google). 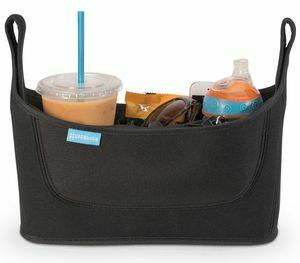 It also doesn't come with a cup holder, but it was easy to buy one to attach to it and the stroller is great enough that I was willing to not have this deter me (and I always have a coffee/water with me). The basket is really quite big and very easy to access when my car seat is attached. It is not as accessible with the bassinet/pram, so I need to be sure to put my bag in the basket and have it positioned well to be able to easily get what I need. The basket is easier to access from the front, though, with the pram. Overall, even though this was more than I had initially planned to spend on a stroller system, I am so happy with this purchase and feel like it was really worth the extra money (e.g. over a Chicco travel system). Already, I have gotten a ton of use out of many of the features and look forward to using this for quite a while. My only concern now is that I want to get a stroller lock so when I have to leave this at the front in a restaurant or at a park that it doesn't go missing! I looked at several different brands and read such mixed reviews until I came across the Uppa Baby Vista. If you look on several websites, the Vista gets near perfect reviews - usually 4.5 out of 5 stars. This stroller has everything we were looking for - adjustable seat and handle, fairly easy to open/close (just press two buttons and push to close; undo a latch to open), bassinet, reversible seat, option to add another seat for a second child, durable, and easy to push. 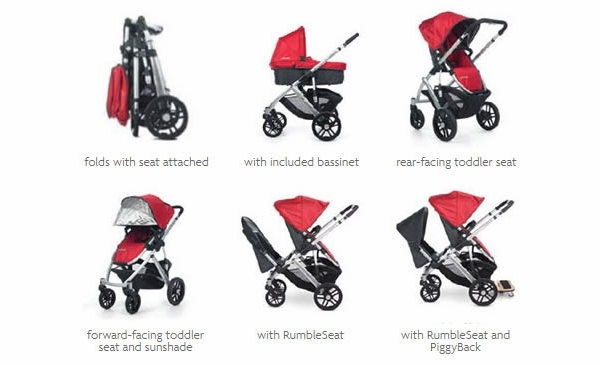 My husband was skeptical that I spent almost $500 on a stroller, but once we received it (within 3 days of ordering it), he loved all the features. The color is nice too - best way to describe it is a dandelion color. Consslightly bulky, but what stroller isn't? After many many trips to different baby stores trying out different brands and hours spent online researching strollers my Husband and I went with the uppa. This stroller has everything we were looking for. We were very adamant about only having one stroller for our son and this literally covers all the bases. It comes with the bassinete which my son loves to fall asleep in and a rear or forward facing seat. We also love the idea that if down the road we decide to have another baby the uppa can convert to a double stroller. The ride is amazingly smooth even when we walk in the sand at the beach. This stroller is also pretty lightweight, I have no problem getting it in and out of our car. We purchased a cheaper bassinet stand from our local baby store and it sits inside just fine next to our bed at night. This is an absolute steal. I've been searching for the last 8 months for this item, and found this site to have the best price. My husband and I were very pleased and excited to receive this stroller. Have been on the search for an Uppa Baby Vista stroller for months and finally ordered this from Albee Baby. I absolutely love it and can't wait for my little one to arrive. My husband is 6'2" and I'm 5'3" it's the perfect height with the telescoping handle. I love how the baby sits higher in the frame (less bending). Our 9 pound Shima loves to ride in the basket below. The yellow is actually fairly dark - dark enough that spills etc. won't be an issue. This is also a GREAT price - the lowest I've found after looking for 5 months! In fact the price is even lower than most people are asking on Craig's List in the Seattle area! If you were even considering purchasing this stroller - I highly recommend it. Click buy now! I decided on this stroller in the beginning of my pregnancy but wasn't sure about color. Finally, when I got it it was much better than I expected!! !Yellow on this picture is not the yellow you are going to get. The real color is much brighter so the stroller looks very bright and fashionable. And package itself is amazing: bassinet, stroller, all the covers. Wheels are big and great for middle east weather. Folds with one click etc...Save 200$- get this color, especially if you are having a girl! We are celebrating the birth of our 4th child. This stroller is not only stylish, but it is well made and durable. Uppababy thought of everything when this stroller was designed. The wheels and joints are sturdy and well made. The stroller will easily take our child from infancy through toddler years. The canopy is the largest that I have ever seen, which provides the baby with sufficient protection from the elements and the basket is huge. If you are merely seeking a "cute" stroller, this is not the stroller for you.